The pieces that I love adding to my wardrobe are those that I can imagine styling in a million ways from day time errands to evenings out on the town. 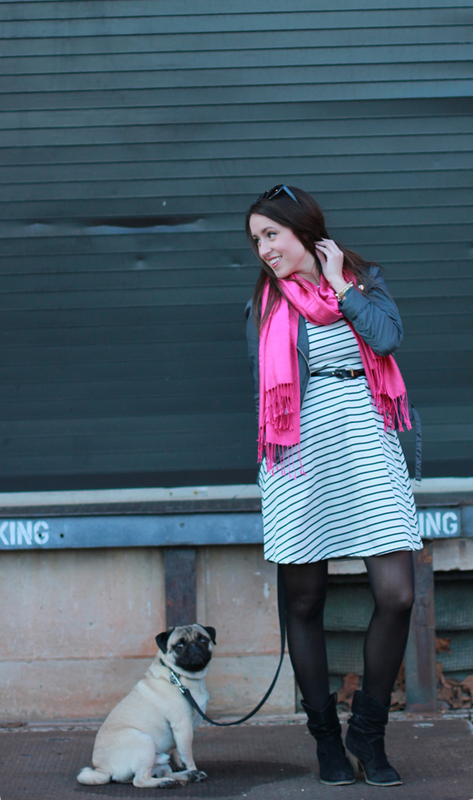 This stripe dress was a score from Boutique Onze using a giveaway gift card won from Adventures in Fashion, & when it arrived I immediately conjured up at least 10 outfits that I can't wait to share with you - this particular rendition is called "chic errand Saturday". What is your go-to styling foundation piece? I can so see this dress a million different ways! Love it with the jacket and boots. I love any pictures that involved your pug...so cute! And I love this dress–so many ways to mix it up! 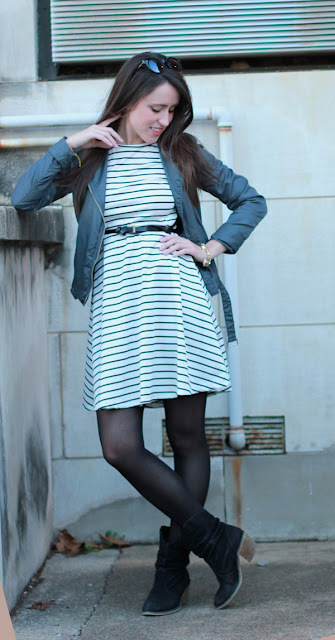 A striped dress is so versatile! Love how you styled it with tights and the ankle boots! Oh that stinkin' little cutie baby pug. I'm obsessed. That striped dress is so versatile. I love this winterized version with tights and boots, but I can't wait to see it in the spring with a bright cardi! I love that dress! Such a chic basic that you could style a million ways. I love it with the pink scarf! My go to piece is a thick strapped, black dress. Very simple. But I love how many different ways I can wear it! Whether I wear tights and throw on a zip up, or wear an oversized sweater, or a blazer, the option are endless! Love this dress paired with those boots, super cute! The pink scarf totally makes this outfit pop. And YAY for a Doug cameo! Love this outfit and I agree, you could style it a million ways! SO cute. Love your dress and that pink scarf... especially together. You pug is adorable too. The pink scarf with your dress is so cute! LOVE LOVE LOVE. You look great!!! This marriage within the only two wonderful features of Full-Framed in addition to Rimless makes semi-rimless glasses a perfect alternative for dozens of buying preferred method to eye-sight things to consider whilst offering of the quality together with durability.